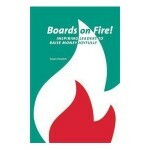 The first book the librarian mentioned to me was Boards on Fire! Inspiring Leaders to Raise Money Joyfully, by Susan Howlett. Dutifully, in order to bring you the latest news, I sat down and read it cover to cover. Okay, I confess, this took me about half an hour. This book is SHORT! No, let’s call it compact. Lots of substance, no fluff. That’s enough to make me joyful right there, in a world where most authors seem to think they have to get their books to one inch thick to be credible. The book contains some excellent points about how to overcome your board’s resistance to fundraising. Even if you’ve heard some of them before, it’s a fine refresher, or something to give to a friend who has become an E.D. or development director and feeling frustrated with the board. The usual reason that board members are unhappy fundraising is that they weren’t told ahead of time that this would be part of their responsibilities. But even the ones who feel this way can be brought into fundraising step by step, through development of genuine relationships with donors. You can’t expect board members to ask others for money until they’ve learned about the organization in depth — its mission (beyond the tag line), its stories, where it fits into the community (including differences from the “competition”), what it actually achieves, and so forth. Board meetings can always be made more interesting! Put fundraising early on the agenda, have one board member per meeting share a “mission moment,” and serve food. The organization can model donor relations in its own relations with the board, by joyfully asking them for support, and thanking them well. That’s not all; as I said, the book is already boiled down to the essentials, so I can’t do any further boiling. In any case, I’ve got to start working on shortening a book of my own.